Soil and re-potting is where the rubber meets the road. Good soil stimulates good roots, proper potting helps to ensure a healthy roots system and tree, and sets the tree properly in the pot to artistically present the tree. We invite any member to bring in a tree for help in re-potting with assistance by experienced club members. You can even get some styling and growing tips. The club will provide soil, wire and pot screen for the re-pot. Proper technique signicantly helps the tree to recover from the re-potting. 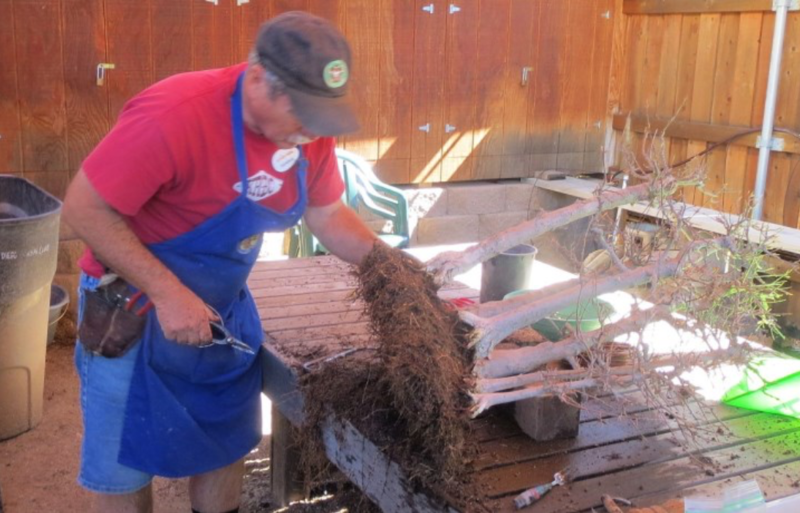 You will be shown how to properly prune roots and secure the tree for stability in the pot. It is an excellent opportunity to see if the nebari (rootage) can be enhanced by properly positioning the tree in the pot; to be sure it is planted at the proper angle, at the correct depth and the proper distances from the sides of the pot. This is also a great time to discuss future pot selection with an expert. You can also get a good education about soil mixes. A good soil mix is extremely important for many reasons: tree recovery from re-potting, preventing root rot from poor drainage, enhancing the growth of smaller roots, proper water and nutrient retention and release. Different soil mixes and mix components will be available for sale. A good soil mix is the foundation for growing a healthy bonsai. To get you up to speed, you may want to watch last January's repotting demonstration by Abe Far.